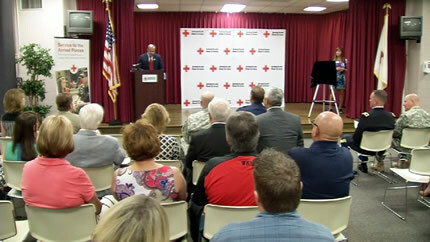 LOUISVILLE, Ky. (WDRB) — There are only two other centers like it in the world, and on Friday, the American Red Cross celebrated upgrades and efficiencies at its Military Emergency Communications Center. The Red Cross provides aid around the globe, which includes helping military members, veterans and their families. The Louisville Area Chapter is one of three military emergency communications centers in the world. 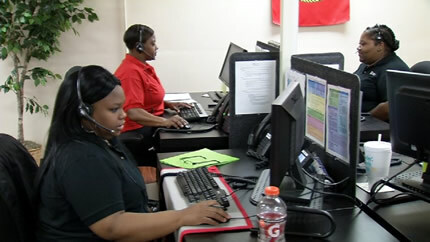 The call centers are available every day of the year at all hours. They act as a direct link between a service member's family and the command staff to get the soldier home for a variety of reasons, like the death of a family member, a serious illness or the birth of a child. Recently, the Louisville Call Center got an airman back to the U.S. from Afghanistan in time to see his mother before open-heart surgery. "We paid for his flight, we gave him some spending cash when he hit the ground. Doug walked off that plane and walked into the hospital room to see his mom walk into surgery, less than 48 hours after we took that call," said Koby Langley, Sr. VP, Service to the Armed Forces with the National American Red Cross. Louisville's Emergency Communications Center has been here since 1999. Recent upgrades were celebrated Friday, like new IT equipment and phone line systems, which will provide quicker response time during emergency communications. A large donation for the call center came from the late Elizabeth Shwab Sanders, who supported the Red Cross during World War II and most of her life. Next month, requests for assistance can be made online, and cloud-based technology will boost communication. Last year, the Red Cross call centers helped more than 300 families a day. 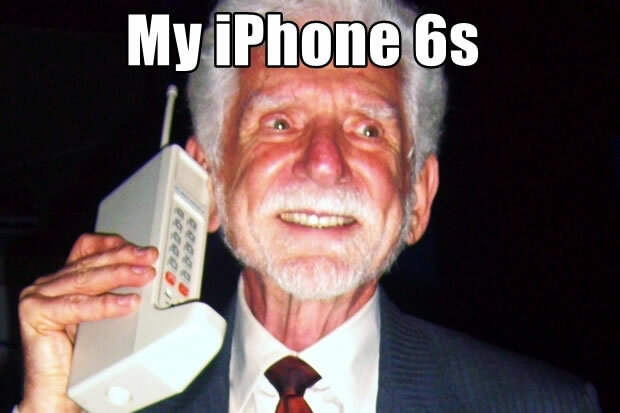 Oh noes: The Apple iPhone 6s will be bigger than today's iPhone. Confirming previous mutterings, photographs from China show an iPhablet that's taller, fatter and wider than before. But not by much. The thought is Apple's making the case stronger, to prevent another rash of bendgate headlines, and making room for Force Touch hardware. But Apple isn't making room for a bigger battery. On the contrary, it seems the new cells in the iPhone 6s and iPhone 6s Plus will actually hold less charge than the previous models. That sounds like a terrible idea. For months, rumors have indicated the upcoming "iPhone 6s" may be . . . larger than its predecessor, likely due to . . . a change in the aluminum being used for the shell, thickening of weak spots [to] address concerns over bending, and new support for Force Touch. [I've] received several photos showing an iPhone 6s [showing] full measurements of the device. [They] show the iPhone 6s measuring 7.08 mm thick compared to Apple's official measurement of 6.9 mm on the iPhone 6. . . . The new photos also reveal slight increases for the height and width . . . 138.19 mm tall and 67.68 mm wide, compared to 138.1 mm and 67.0 mm. As size increases go [it] isn't the most ground (or pocket) breaking leap, but it does make us wonder what other tech Apple could be making room for. A report from the usually-reliable KGI [says] the front camera will be upgraded to 5MP [and] the rear camera lens may not be sapphire, as it . . . failed drop tests. ... It is more brittle, and thus at greater risk of shattering when dropped. For all the attention Apple has received this year for its new smartwatch . . . music service . . . updated TV device and building a car, the company is increasingly dependent on the iPhone. Since the handset was introduced in 2007, the company has never collected as large a percentage of its revenue from one product as it's doing now. The device has become critical to Apple, as almost two-thirds of the company's revenue comes from iPhone sales. Along with the iPhone, the company is expected to introduce at the event an update to Apple TV [and a] bigger-screen iPad . . . Apple declined to comment. Both the iPhone 6S and iPhone 6S Plus will have reduced battery capacities . . . 5.3% for the iPhone 6S and 5.5% for the iPhone 6S Plus to be exact [but] battery life is already one of the worst features of the iPhone 6. Worst . . . Apple will maintain the same storage tiers as the iPhone 6 and iPhone 6 Plus of 16GB, 64GB and 128GB . . . 4K video . . . could fill . . . a 16GB iPhone 6S . . . in about 25 minutes . . . ut I’m sure Apple will be happy to sell you more iCloud storage. Our world and the technologies we use are changing rapidly . As such, the information technology used by the Federal Communications Commission must change as well. Over the past year, we have made significant progress to upgrade and modernize our infrastructure , and we continue to work on modernizing the FCC’s legacy IT systems with the resources we have available. 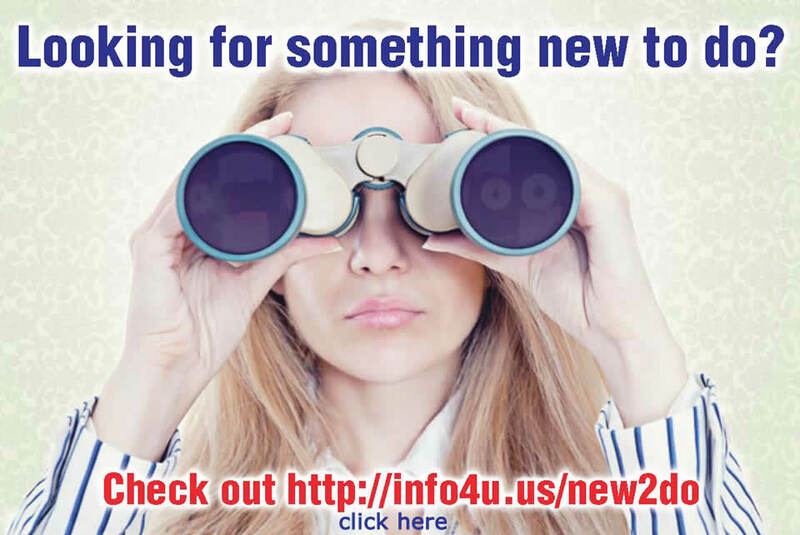 Over the Labor Day Weekend, the FCC IT Team will be working to upgrade and modernize the FCC’s legacy infrastructure. Starting Wednesday, September 2nd at 6pm EDT, interactive public-facing web applications hosted at the FCC will not be available. We will work to have these web applications upgraded and available again by the morning of 8am EDT on Tuesday, September 8 th . These web applications will include our Electronic Comment Filing System (ECFS), Electronic Document Management System (EDOCS), Universal Licensing System (ULS), National Broadband Map , and other public-facing applications. Static content web pages under the www.fcc.gov domain, like the FCC’s consumer guides, should remain available during this period. Of note, our cloud-based FCC Consumer Help Desk , recently modernized to a Software as a Service (SaaS) option, will continue to operate uninterrupted. It is our goal to modernize more of the FCC’s legacy IT to SaaS and other cloud-based platform options going forward. This modernization is more flexible, secure and resilient, as well as more cost effective compared to the costs of maintaining on-premise IT solutions. We understand that this temporary downtime before and during the Labor Day Weekend may be inconvenient for some FCC stakeholders; however, we have taken a number of steps to mitigate this wherever possible. For example, filing deadlines for all Commission proceedings that happen to fall during the affected time period will automatically be extended; more specific details can be found in a Public Notice here . This work effort over the Labor Day Weekend is the latest in a series of on-going work to improve the FCC’s legacy IT systems , reduce how much we spend on our legacy infrastructure, and improve public engagement with the Commission. The entire FCC IT Team thanks you for your support and understanding. A California university student is lucky to be shaken but unharmed after a mugger shot at him during a robbery — but the bullet was deflected by his iPhone, police said. Police said the victim was approaching the front door of his apartment near the California State University, Fresno at around 11 p.m. Monday when a gunman approached him from behind, pulled out a handgun and tried to grab the student's computer bag. 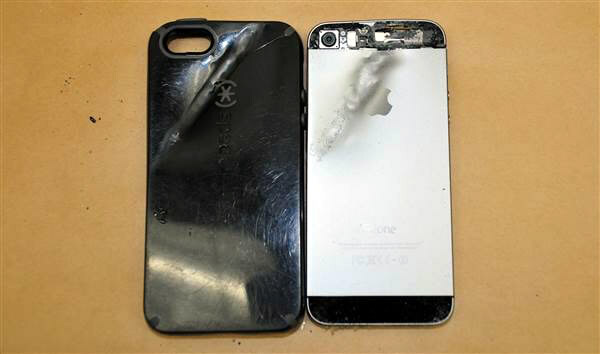 During a struggle over the bag the gunman fired at the 24-year-old, but the bullet "skipped off" the iPhone in his pocket, police said. "He said 'It saved my life,'" the graduate student's roommate, who did not want to be identified because the gunman is still on the loose, told NBC affiliate KSEE in Fresno. "The jeans was tore and he showed me his iPhone ... and I saw the bullet was really clear on it. So it saved his life," he told the station. The victim was not identified. The gunman made off with the computer bag, which had an HP laptop inside, police said. Police described the suspect as around 5 feet, 10 inches tall and 170 pounds, and said he was wearing a mask. After surviving the frightening mugging, the victim packed his stuff and moved out, and has no plans to return to Fresno, his roommate told KSEE. The apartment building where the robbery occurred is near campus. Fresno police Lt. Joe Gomez said he couldn't recall another time in Fresno where a bullet was deflected by a cell phone. Picking radio channels is becoming frighteningly routine for emergency personnel. Gulf County Sheriff Mike Harrison said last week that in some parts of the county his deputies have to use the channel reserved for firefighters to communicate with each other. If they can even communicate over that channel. Harrison told county commissioners that a communications system that has chronic issues borne of age has become itself an emergency for first responders in the county. “We are in a bad situation right now,” Harrison said. “We have people who can’t communicate with dispatch, can’t communicate with each other, can’t communicate with outside agencies. The work, and bill, to address that emergency increased last week and county administrator Don Butler said that even after repairs ongoing and approved last week for the near-future, communications will still far short of ideal. “If you had $1 million you could go out and buy the perfect system, but money is limited,” Butler said. “(After approved repairs) we will still have considerable work that needs to be done. Contractors have been inspecting the system for months and already slated to be done was fixing cabling and antennas for the communications channels used by the law enforcement and EMS. Also already in the works, providing proper grounding, or halo, around the county courthouse complex, where the systems are located. That work is aimed at preventing occurrences such as last year when a lightning strike, and resultant damage sparked into high gear overhauling the first responder communications. Last week, commissioners decided to expand both sides of the equation. They approved spending the additional money for the cabling and antennas work to be done for the fire channel. That brings the bill for the cabling and antennas to $19,700, Butler said. Commissioners also expanded the grounding work by another $7,890 due to continued decay of the system since it was first assessed and speced out. Butler said properly grounding guide wires will help protect the components of the communications infrastructure, including a new repeater required after the lightning strike. “This is an insurance policy,” Harrison said of the work to the system. There are still obstacles, including the reality that communications, even with cell phones, is spotty, at best, once on Cape San Blas and St. Joseph Peninsula. A new cell tower is going up near the intersection of State/County 30A and State/County 30E that will hopefully ease the situation but to what distance is an unknown. “This has been an emergency for a couple of years now … (the repair work) needs to be done,” said Commissioner Joanna Bryan. Butler said even after the repairs, work will be needed to maintain the aging system. The SO needs a new communications console, guide wires need re-tensioning and towers must be sandblasted to eliminate rust. “This is old technology … but at least we can communicate,” Butler said of the repairs. Harrison announced he would hold a town hall meeting 6 p.m. ET Sept. 15 in the BOCC meeting room in the Robert Moore Courthouse Annex. This will be another in a continuing series of town hall meetings the sheriff has and will hold throughout the county to discuss issues with the public. SPRINGFIELD, Va.—(BUSINESS WIRE)—Sep. 3, 2015—Spok, Inc. announced today the release of its new T5 SOLUTION, a select pager with an encrypted paging option. 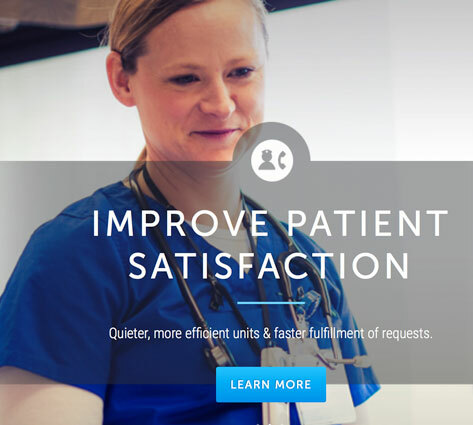 With secure messaging capabilities and display-lock security features, this device provides a powerful tool for healthcare and emergency response communication. Providing reliable messaging service in a small, convenient package, the T5 has a user-friendly, icon-driven interface, easy-to-read screen, and long battery life. 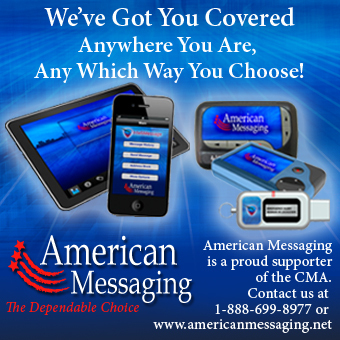 It offers encrypted message support, remote data wipe, and display-lock security features. Spok, Inc., a wholly owned subsidiary of Spok Holdings, Inc. (NASDAQ: SPOK), headquartered in Springfield, Va., is proud to be a leader in critical communications for healthcare, government, public safety, and other industries. We deliver smart, reliable solutions to help protect the health, well-being, and safety of people around the globe. Organizations worldwide rely on Spok for workflow improvement, secure texting, paging services, contact center optimization, and public safety response. When communications matter, Spok delivers. Visit us at SPOK.COM or find us on Twitter @Spoktweets. Spok is a trademark of Spok Holdings, Inc.
Any clients seeking to make changes to their data plans and, in particular, changes to limit or eliminate unlimited data plans, should make sure that any such changes and customer notifications and information do not run afoul of the FCC’s Open Internet rules. This includes making sure any changes comply with the Transparency Rule, which requires broadband providers to disclose the expected and actual access speed of their services. The Transparency Rule also requires accuracy in all statements regarding network management practices, performance, and commercial terms, including those in contracts, customer notifications, advertising and on a website, and prohibits providers from “making assertions about their service that contain errors, are inconsistent with the provider's disclosure statement, or are misleading or deceptive.” In assessing a substantial fine against AT&T for data throttling, the FCC parsed various AT&T practices that the company felt were justified, but which the FCC found to be deficient. We can help our clients avoid similar “land mines” when adopting their data management plan. If not done correctly to begin with, a deficient data management plan can lead to a large fine, since by the time it comes under scrutiny (by, e.g., customer complaint), several months or even years of what the FCC may view as inappropriate throttling may have occurred. If you would like assistance in making sure you avoid running afoul of the Open Internet rules when making changes to your data plans, please contact the firm. In early August, the FCC issued an order in its Technology Transitions proceeding (GN Docket No. 13-5) that adopts detailed procedures for providing Part 51 notices of network changes for copper retirements. For the purposes of such notices, “copper retirements” are defined as: (a) the removal or rendering inoperable of copper loops, sub-loops, or the feeder portion of copper loops or sub-loops; (b) replacement of copper loops with fiber-to-the-curb (“FTTC”) or fiber-to-the-home (“FTTH”) facilities; or (c) de facto retirements due to failure to maintain copper facilities. Since the network change notice requirements in Section 251(c)(5) the Telecommunications Act of 1996 were implemented in 1997, rural local exchange carriers (“RLECs”) with a Section 251(f)(1) rural exemption may have reasonably assumed that they were not subject to them unless and until their state commissions had terminated their rural exemption. However, in its August order, the FCC denied a request by a consulting firm that RLECs be exempted from its revised copper retirement notice rules. The FCC stated that the notice requirements did not constitute a great burden on RLECs, and that rural customers needed information regarding planned copper retirements as much as urban and suburban customers. The FCC order did not make any reference to the statutory rural exemption in Section 251(f)(1) of the Act, or to the fact that this exemption relieves RLECs of the obligation to comply with Section 251(c), including the 251(c)(5) network change notice requirements, unless and until an RLEC’s state commission terminates the exemption. Whereas state commissions have terminated the Section 251(f)(1) rural exemptions of some RLECs, many RLECs still retain their statutory exemption. In addition, the FCC did not thoroughly consider the adverse impacts upon the already difficult and expensive broadband deployments of RLECs and other small carriers of the delays and costs of its new copper retirement notice requirements. It is likely that the FCC’s attempt to apply these rules to all RLECs will be subject to reconsideration petitions and/or judicial appeals once the deadlines for such processes are established. For those RLECs who do not have a Section 251(f)(1) rural exemption or whose Section 251(f)(1) rural exemption has been terminated by their state commission (and for other RLECs if the FCC elects to disregard the statutory rural exemption and is upheld by the courts), the revised copper retirement notice provisions are substantial and must be initiated more than 180 days before copper facilities are actually cut-over to FTTC or FTTH. Clients should note that this is a notice requirement only, and that FCC approval is not necessary except in certain limited situations where a copper requirement is deemed to be a discontinuation of service requiring a Section 214 application and grant (see below). Note also that the copper retirement notice requirements do not apply to situations where a carrier cuts a single customer over to fiber in order to resolve a particular service problem. However, the FCC’s notice requirement with respect to an “affected area” is not very clear. It plainly encompasses an exchange, and very probably encompasses a development, neighborhood, or other significant cluster or portion of an exchange. It probably does not include a small number of locations (e.g., 5-to-10 customers) where fiber is installed to solve maintenance and service problems, rather than as part of a planned conversion of copper to fiber. Where an RLEC is planning a substantial fiber deployment that is going to take 3-to-6 months or so to complete (or where a project gets significantly delayed beyond its initial target dates), a single group of notices and filings “at least” 180 days and “at least” 90 days prior to the actual cutovers (as described below) should suffice. Initial Set of Notices More Than 180 Days Before the Initial Desired Cutover Date. An ILEC must send notices of its planned network changes to (1) the FCC; (2) the Governor of its state; (3) its state commission; (4) the Special Assistant for Telecommunications, Department of Defense; (5) the Tribal entity with authority over any Tribal lands involved; and (6) CLECs and other service providers that directly interconnect with the ILEC. These notices are all identical, have no required format, but must include: (a) the ILEC’s name and address; (b) the name and telephone number of an ILEC contact person who can answer questions about the changes; (c) the implementation date of the planned changes; (d) the location(s) at which the changes will occur; (e) a description of the type of changes planned; (f) a general description of the reasonably foreseeable impact of the planned changes; (g) any changes in prices, terms and conditions that accompany the changes; and (h) if certain of the foregoing information is proprietary and confidential, a statement that the ILEC will make such further information available to those signing a nondisclosure agreement. 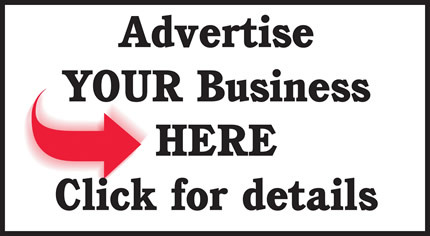 BloostonLaw will be glad to provide you with a recommended template for the notices upon request. Different Notice to Be Sent to Non-Residential Retail Customers More Than 180 Days Before the Initial Cutover Date. Business and anchor institution customers within the affected area must receive the same notice as residential retail customers, but must receive such notice at least 180 days prior to the cutover (rather than at least 90 days like the residential customers). FCC Will Then Issue a Public Notice That Sets the 180-Day Period after which the ILEC can begin its cutovers from copper to fiber. Notices to Retail Customers At Least 90 Days Before the FCC-Designated Cutover Period Begins. These notices must go to residential customers within the affected area that are losing copper facilities to their premises. These notices may be sent by mail or e-mail (although e-mail distribution requires customer consent and ILEC monitoring). There is no required format, but these notices: (a) must be “clear and conspicuous”; (b) should include a “neutral” statement of the customer’s service options (i.e., the ILEC must not aggressively market its services in this notice; but is free to do so subsequently); and (c) must contain a toll-free number to contact the ILEC, a website address where more information can be found, and the Internet address of the FCC’s consumer complaint portal. Certificate of Service to Be Filed with FCC 90 Days Before FCC-Designated Cutover Period Begins. This is a substantial document that must be completed after all the foregoing notices have been sent, signed by an officer of the ILEC, and filed with the FCC. Among other things, it must include: (a) a statement that identifies the proposed changes; (b) statements that each of the required notices have been sent to all of the required recipients; (c) a list of the names and addresses of all of the CLECs and other service providers that directly interconnect with the ILEC to which the initial notice was sent; (d) a statement that the ILEC has complied with its requirement to communicate in good faith with the listed CLECs and other directly interconnecting service providers; (e) a copy of the notice sent to residential and non-residential retail customers; and (f) the docket and other identifying numbers assigned by the FCC to the ILEC’s notice. In most situations involving RLEC replacement of copper loops, sub-loops and feeder with fiber, the network change notice rules will be the only FCC requirement that may apply (again, assuming that the statutory rural exemption has been terminated by a state commission or successfully disregarded by the FCC). However, in some situations, the Section 214 requirement to obtain prior FCC approval before discontinuing, reducing or impairing a service may apply. The FCC’s August order focused predominately upon fiber conversions that would eliminate copper unbundled network elements and/or other wholesale inputs that CLECs and other carrier-customers were using to provide service to their end users. The FCC required ILECs to consult with their CLEC and other carrier-customers and to make a “meaningful evaluation” as to whether the planned copper replacements would discontinue, reduce or impair service to the carrier-customer’s end users (in which case a Section 214 application would need to be filed and granted) or would not do so (for users (in which case a Section 214 application would need to be filed and granted) or would not do so (for example, because adequate replacement or substitute services were available) in which case the network change notice would be sufficient. The FCC has initiated a further rulemaking to establish more detailed criteria for determining whether adequate substitute services are available. It will very important to ensure that all of the required notices and filings are completed in a timely and correct fashion, especially the certificate of service. We are available to assist our clients with this process. The FCC’s Wireline Competition Bureau has released revised and intermediate illustrative results of the Alternative Connect America Cost Model (“A-CAM”) that is being developed by the Bureau for use as the basis for offering an option of model-based universal service support to rural local exchange carrier (“RLEC”) study areas at a future date (probably, starting in either July 2016 or January 2017). Please note that this is not the final version of the A-CAM results. Rather, it is the second version, which differs from the initial March 6, 2015 version in that December 2014 Form 477 data has been used to exclude from support calculations Census Blocks where unsubsidized voice and fixed broadband providers have claimed that they offer 10 Megabits per second (“Mbps”) downstream/1 Mbps upstream (or better) service. The Bureau will make several further revisions — including updating the Form 477 data to that for June 2015 (filed September 1, 2015), finishing its correction of study area boundaries, and incorporating plant mix revisions for RLECs choosing to file them — before releasing a final run of the A-CAM setting forth the tentative amount of model-based support for each RLEC study area. Please note further that the final version of the A-CAM results is not likely to specify the exact amount of support that each study area that elects the model-based support option will actually receive. Rather, that actual amount will depend upon: (1) the number of RLEC study areas that elect model-based support; and (2) the amount of Connect America Fund (“CAF”) reserves that the FCC will allocate to fund support increases for the electing study areas ($100 million and $200 million per year for 10 years have been mentioned, but no final FCC commitment has been made). It is assumed that each electing RLEC study area will receive an amount of model-based equal to its “current” (2014 or 2015) High Cost Loop Support (“HCLS”) and Interstate Common Line Support (“ICLS”), plus some portion of its incremental A-CAM-specified support, and that it will have an obligation to build 10/1 broadband to a specified minimum number of locations during a 10-year period in return for the support. Ultimately, RLECs will have to decide for each of their study areas whether the additional model-based support and the associated number of additional locations they are obligated to serve with 10/1 broadband make it reasonable to elect model-based support, or whether they should keep some or all of their study areas on a revised rate-of-return alternative. In addition to excluding Census Blocks assumed to be served by unsubsidized voice and fixed broadband providers, the current August 31, 2015 illustrative results assume a $52.50 per month funding benchmark (i.e., they assume that the RLEC will collect $52.50 per line per month from its customers or other sources, or forego some revenue), and cap model-based support at three alternative amounts: $200, $215 and $230 per location. With a funding cap of $215 per location, 601 of the 1,092 RLEC study areas would receive model-based support greater than their 2014 HCLS and ICLS, while 491 study areas would receive less model-based support. If every RLEC elected model-based support, total model-based support would be $1,544,381,533 compared with total HCLS and ICLS support of $1,642,409,236 for 2014. With a funding cap of $230 per location, 612 of the 1,092 RLEC study areas would receive model-based support greater than their 2014 HCLS and ICLS, while 480 study areas would receive less model-based support. If every RLEC elected model-based support, total model-based support would be $1,581,782,264 compared with total HCLS and ICLS support of $1,642,409,236 for 2014. Note that it is not likely that every company that receives more model-based support than its existing HCLS and ICLS support will elect to opt into the model mechanism, or that every company that loses support under the model will elect to remain on the rate-of-return mechanisms. There are likely to be other considerations, including stability, certainty and build-out obligations. Note, however, that the respective $139 million, $98 million and $61 million reductions in model-based support vis-à-vis existing high-cost support may tempt the FCC to make model-based support mandatory rather than optional at some future date. Also note that the combination of a majority of study areas gaining support under the model with an overall reduction of total support under the model means that the typical “loser” under the model is losing more support than the typical “winner” is gaining. 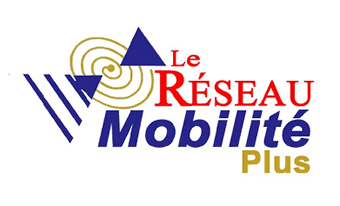 Whereas they have not objected to a voluntary model-based path that can be freely elected by RLECs on a study area basis, rural associations such as NTCA and WTA have questioned whether the significant increases and decreases in model-based support for many RLEC study areas are due to flaws in a model developed for much larger price cap carriers rather than relative efficiencies and inefficiencies, and have asked the FCC to review and revise its A-CAM model between the initial opt-in period and any subsequent one. Any client needing assistance in obtaining or analyzing the August 31, 2015 A-CAM illustrative results can contact the firm. To ensure “that all consumers understand the risks associated with non-line-powered 911 service, know how to protect themselves from such risks, and have a meaningful opportunity to do so,” the FCC has adopted new Rule Section 12.5, which requires providers of facilities-based, fixed, voice residential service that is not line powered to offer new subscribers the option to purchase a backup power solution and to notify subscribers, at the point of sale and annually thereafter, of the availability of backup power purchasing options. The 8 hour backup power requirement will become effective 120 days after publication of the Order in the Federal Register, except that this requirement will become effective 300 days after Federal Register publication for providers that have fewer than 100,000 domestic retail subscriber lines. The disclosure provisions of the rules will become effective 120 days after the FCC notifies the public that approval has been received from the Office of Management and Budget, except that these obligations will become effective 300 days after the FCC notifies the public that approval has been received from the Office of Management and Budget for providers that have fewer than 100,000 domestic retail subscriber lines. The obligation to offer 24 hours of backup power will become effective on the same extended three-year schedule for all providers. First, all providers of facilities-based, fixed, voice residential service that is not line powered (providers), are required to offer new subscribers the option to purchase a backup solution that provides at least 8 hours of standby power during a commercial power outage. Within three years, providers must offer at least one option that provides a minimum of 24 hours of 911 service. (A 24 hour solution could consist of three 8-hour batteries). Providers include fixed applications of wireless service offered as a “plain old telephone service” (POTS) replacement. The FCC clarifies that a wireless voice service is “fixed” for purposes of this rule if it is marketed as a replacement for line-powered telephone service and is intended primarily for use at a fixed location. The use of a femtocell or similar equipment in a residential setting does not automatically convert a mobile service into a fixed service. According to the FCC, the decisive factor is whether the service is intended to function as or substitute for a "fixed" voice service. To meet the backup power requirement initially, “providers of covered services must offer, at the point of sale, to install a technical solution capable of supporting at least 8 hours of uninterrupted 911 service during a power outage. Within three years, providers must also offer, at the point of sale, a technical solution capable of supporting 24 hours of uninterrupted 911 service if the subscriber desires additional backup power.” The backup power requirements are based on the amount of time a technical solution can maintain a covered service in standby mode, i.e., able to provide a dial tone and to initiate and receive voice calls, but not necessarily in continuous use. Providers must make backup power available to the consumer and install appropriate backup power upon initial installation of service if requested by the consumer. The FCC expects that installers should be able to answer questions about backup power. The FCC does not specify the means by which providers of covered services offer to supply these amounts of backup power. According to the FCC, “a provider could offer a solution with a single, internal battery delivering 8 hours of backup power. With respect to the 24-hour option required within three years, providers may choose to offer consumers a single 24-hour battery (or battery tray as offered by Verizon), three 8-hour batteries, or some other combination of installed and spare batteries, UPS systems or other technologies to provide 24 hours total. If the solution requires a proprietary battery or other equipment that is not widely available in retail stores, the equipment should be provided as part of the installation of service. 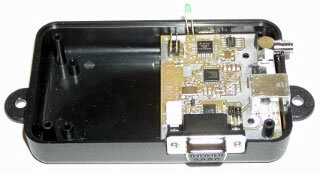 If, however, the solution accepts commonly available equipment such as D-Cell batteries, providers need not supply such equipment themselves, as long as they notify subscribers at the point of sale that it is not included and must be supplied by the subscriber for the solution to function properly.” The FCC states, however, that providers are required "to assist with the installation of customer-supplied batteries such as D-Cells to the extent that subscribers obtain and make such batteries available when service is installed." According to the FCC, in cases involving spare batteries that are not widely available at retail stores, the solution offered to subscribers should also include a charger or some other method of ensuring that such batteries are stored in a charged state. The FCC states that "a provider could offer a backup power system using standard D-Cell batteries without including a supplemental charger because such batteries are widely available at local retailers. A solution based on less widely available batteries such as sealed lead-acid or lithium-ion cells should include a charger to ensure that spare batteries are maintained in a charged state." The FCC also makes clear that providers of covered services may charge subscribers for backup power capabilities, if subscribers wish to purchase them. The FCC does not specify the rates at which providers of covered services may offer backup power or related accessories and states that a service provider “can receive compensation for all aspects of implementing the rules we adopt today, including the backup power installation, and costs of equipment and labor, from the consumer that elects to have backup power installed.” The FCC does not preclude service providers from including backup power capabilities without separate charge, if they choose to do so. backup power warranty details, if any. The FCC strongly encourages providers to assist subscribers in developing a plan for extended backup power by notifying them of options to extend backup power beyond the life of the battery, such as informing subscribers that they could purchase several backup power units for use during prolonged outages and provide directions for rotating these as required to keep the units charged. The FCC also strongly encourages providers to inform subscribers of any available accessories such as solar or car chargers, which may be able to recharge a depleted backup power unit. When applicable, providers should inform subscribers of the availability of deployed mobile charging stations when the provider deploys them. Third, the FCC's rule and requirements will sunset on September 1, 2025. The FCC expects that, over time, “the marketplace and consumer expectations will evolve along with advances in technology so that adequate backup power solutions and availability will become commonplace.” The FCC anticipates that a ten-year period “will allow sufficient time for a 'cultural and educational shift' in consumer expectations, along with marketplace and technological development” at which time, “[c]onsumers will then be empowered to assume primary responsibility over their backup power, similar to the responsibility consumers now bear for mobile devices they may rely on for 911 access during an emergency.” However, if the FCC determines after ten years that the marketplace and expectations have not evolved as expected, it leaves open the possibility of taking action to extend and/or modify the requirements contained in the Order. On August 25, salesforce.com, Inc. and its wholly-owned subsidiary, ExactTarget, Inc. filed a petition for review of July’s TCPA Omnibus Declaratory Ruling and Order (“Order”) with the U.S. Court of Appeals for the District of Columbia Circuit. In the Order, the FCC addressed a number of issues associated with the Telecommunications Consumer Protection Act (TCPA), including creating a clear definition of “automatic telephone dialing system” and clarifying liability for calling parties who have revoked prior consent, among others. According to the petitioners, the Order unlawfully exceeded the FCC’s authority by concluding that the term “automatic telephone dialing system” covers equipment that cannot, without modification, “store or produce telephone numbers to be called, using a random or sequential number generator” and “dial such numbers.” The petitioners also argue that the Order improperly defines the term “called party” within the TCPA’s provision prohibiting any call meeting certain conditions “other than a call made . . . with the prior express consent of the called party” in a way that makes it impossible for callers to ensure that prior express consent is still valid at the time of the call. Finally, the petitioners argue that the FCC’s treatment of “prior express written consent” and revocation of consent is inconsistent with prior FCC statements, exceeds the FCC’s authority, and puts and undue and excessive burden on callers. Certain minority ownership changes can require FCC approval ( e.g., transfer of a minority stock interest, giving the recipient extraordinary voting rights or powers through officer or board position). Modernizing Contest Rules – The Commission will consider a Report and Order to provide broadcasters greater flexibility in their disclosure of contest terms. Submarine Cable Reliability – The Commission will consider a Notice of Proposed Rulemaking that proposes to require submarine cable licensees to report outages. The Open Meeting is scheduled to commence at 10:30 a.m. in Room TW-C305 of the Federal Communications Commission, 445 12th Street, S.W., Washington, D.C., and will be shown live online at www.fcc.gov/live . On August 31, the FCC published Notice in the Federal Register seeking Paperwork Reduction Act (PRA) comments on the new rules adopted in the 2015 Lifeline Second Reform Order regarding. Comments are due by October 30. Specifically, the FCC seeks comment on the retention of subscriber eligibility documentation, ETC designation, and ETC reimbursement under the Lifeline program; revision to Form 555 and the accompanying instructions to require ETCs to provide a Service Provider Identification Number; and updates to the Form 497 instructions and requirement to electronically file Forms 497 and 555. Companies interested in filing PRA comments regarding the burdens associated with complying with the new information collection requirements should contact the firm for more information. On August 27, the FCC denied three separate applications for review filed by Rural Broadband Services Corporation (RBSC), Lennon Telephone Company (Lennon) and Last Mile Broadband LLC (Last Mile). In January, the Wireline Competition Bureau denied petitions from 15 entities seeking waiver of the FCC's financial and technical information requirements and removed them from further consideration for funding, including RBSC and Last Mile. The Bureau also removed Lennon from further consideration for failing to file the required financial information and not submitting a waiver request. It is those actions for which the applicants seek review. On review, however, the FCC upheld the Bureau’s decisions in full. Specifically, the FCC upheld the Bureau’s decision not to grant the waivers requested by RBSC and Last Mile because, “[s]trict enforcement by the Bureau of the filing requirements adopted by the Commission was appropriate given the purpose of the rural broadband experiments and our commitment not to allow the rural broadband experiments to delay the offer of model-based support to price cap carriers.” It upheld the decision to remove Lennon from consideration because “[a]pplicants were expected to familiarize themselves fully with the Commission’s rules and requirements for the rural broadband experiments.” Therefore, the fact that Lennon mistakenly believed that because the Commission allows privately held rate-of-return carriers to submit reviewed financial statements in their annual FCC Form 481, it was permissible to submit reviewed statements for the rural broadband experiments as well, was not enough to cause the FCC to reverse the Bureau’s decision. The FCC recently announced the imposition of a $2.96 million dollar fine against Travel Club Marketing for illegal robocalls – the largest fine for robocall violations to date. As we have reported over the years, the FCC and the FTC have taken strong positions against perceived consumer rights abuses, including violations of Do-Not-Call Lists, Fax Spamming and the use of auto-dialer robocalls to landline and wireless phones. In reviewing the complaints against Travel Club Marketing, the FCC noted that it had made or initiated over 185 unsolicited pre-recorded robocalls to over 142 consumers who had not consented to receive such calls. In fact, the vast majority had previously placed their phone numbers on the National Do-Not-Call Registry. For those clients that engage in telemarketing – whether it is for their internal business or as a service to others, we recommend that you ensure that your systems are updated regularly, as required by the FCC and the FTC so that you do not inadvertently include any phone numbers that are on the National Do-Not Call Registry. Over the past several months, industry sources have noted an increasing number of pre-recorded phone calls being made to wireless phones under the guise of a past business relationship – even where the relationship did not exist. Because many of these types of phone calls can come from fraudsters, the FCC and the FTC are especially attuned to the issue – as evidenced by the record fine that was imposed against Travel Club Marketing. Clients with any questions or concerns should contact our office. The FCC has cited Jian Chang, the owner of a building in Queens, New York, for causing harmful interference to Sprint’s 1900 MHz cellular system. The FCC determined that the source of the interference was a Part 15 device that was being operated on the Chang property. When the FCC field inspectors came to Mr. Chang’s property, he refused the FCC access and refused to allow an inspection of any Part 15 devices in his possession. 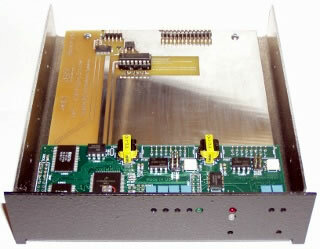 It is important to note that the FCC’s Rules require users of Part 15 devices to cooperate with FCC field inspectors. This is due in part to the fact that even though Part 15 devices do not require an FCC license, users of these devices may not cause harmful interference to licensed operations and must accept interference from other devices. Dennis Roberson, Vice Provost and Research Professor, Illinois Institute of Technology, serves as Chairman of the Council. Walter Johnston, Chief of the Electromagnetic Compatibility Division, serves as the Designated Federal Officer. 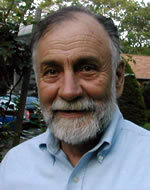 Julius Knapp, Chief of the Office of Engineering and Technology is the Alternate Designated Federal Officer. The meeting will be held in the Commission Meeting Room at 445 12th Street SW, Washington, DC and is scheduled to begin at 1:00pm and end at 4:00pm. All meetings will be webcast and accessible from https://www.fcc.gov/live. Last week, The New York Times published an article detailing a growing dispute between Verizon and the city of New York about whether Verizon has met its promise to “pass all three million homes in the city” by the end of 2014. According to the article, in 2008 Verizon agreed to offer FiOS service to all homes in New York City, with the aim of increasing competition and offering customers better options. According to the city’s Department of Information Technology and Telecommunications, Verizon “systematically refused to accept orders for residential service” and, by the company’s admission, nearly one-fourth of the blocks in the city have no buildings wired for FiOS. At the time, Verizon argued that it met its obligations because the term “pass” meant only that the company had to have fiber in place so that it could provide FiOS within a year to any resident who requested it. Further, according to Verizon, most cases it was prevented from actually providing service by an uncooperative landlord or the like. Interestingly, however, the Times goes on to report that several Verizon employees have disputed the company’s assertions, stating that after wiring all of Staten Island, Verizon “significantly slowed the expansion” to the rest of the city and had been shifting its work force from the wire-line side to the wireless side. Sep. 9 – Reply comments are due on Transparency Exemption proceeding. Sep. 15 – Reply comments on Lifeline Further Notice of Proposed Rulemaking are due. Sep. 21 – Reply comments are due on Video Programming Competition report. 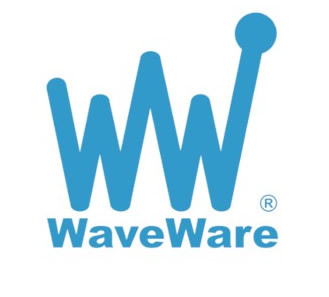 I just read the August 28 th Wireless Messaging News and information regarding your New Radio Project. Very impressive for a 1 watt transmission. I found it interesting that this work came out of the WSPR program that Joe Taylor and Russ Hulse created. Russ was actually my college classmate in 4 years at The Cooper Union (NYC). We were both getting our Physics degrees and our entire physics class took all their classes together from physics, to math, to chemistry, to humanities. Russ was 15 years old when the rest of us were 18. He knew everything about astronomy that one could imagine. He was also the one who would walk out after 1 hour of a 2 hour open-book physics exam without using a book, and end up getting the highest score in the class. We all said that if anyone from our college was ever going to get a Nobel Prize, it was going to be Russ. And sure enough, he won the prize for the pulsar work he did one year after graduating from our class. 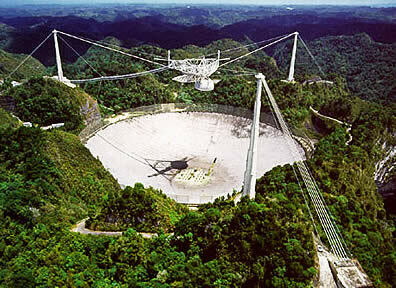 In fact it was a friend of mine who was a salesman at ModComp Computer, that got Russ a free computer to take with him to the radio telescope in Arecibo, Puerto Rico, where he made the discovery of binary pulsars. It was also through that same salesman that I ended up working on the creation of radio paging systems used for the largest Radio Paging company in the US at that time. Here is something in English about the last TV movie. Next will be . . . next week. And so on. . .
What we see: all the time his financial activities are shown as being connected with our services. He used . . . the press says hundred times a day . . . his e*Broker from e*Message. In Time, not delayed, One to Many. What we try to communicate is that these characteristics of our services are used today — for instance in the renewable energy environment for switching services, called e*Nergy or . . . to alert firemen or or . . . In [real] Time, not delayed, and Reliable and One to Many. Diese E-Mail einschließlich eventuell angehängter Dateien enthält vertrauliche und/oder rechtlich geschützte Informationen. Wenn Sie nicht der richtige Adressat sind und diese E-Mail irrtümlich erhalten haben, dürfen Sie weder den Inhalt dieser E-Mail nutzen noch dürfen Sie die angehängten Dateien öffnen und auch nichts kopieren oder weitergeben/verbreiten. Bitte verständigen Sie den Absender und löschen diese e-Mail und eventuell angehängte Dateien umgehend. Vielen Dank. AUTHOR: JENNA GARRETT. JENNA GARRETT PHOTO DATE OF PUBLICATION: 08.22.15. The Hubble captured a gorgeous cosmic couple that is the star Hen 2-427 and the nebula M1-67 some 15,000 light-years from Earth. 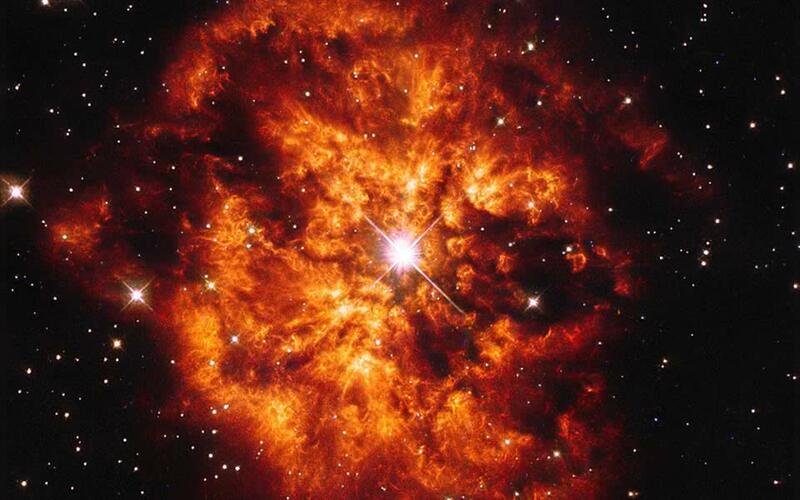 The bright center is Hen 2-427, a Wolf-Rayet star known for its intense heat and explosions. The colorful gases surrounding are the nebula M1-67. At barely 10,000 years old, they make the perfect pair and a stunning sight.